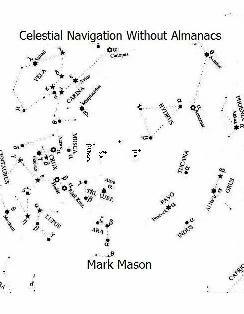 With this book, Celestial Navigation Without Almanacs, you can find your latitude and longitude at sea at any time up to the year 2050, and even beyond, without having to have sight reduction tables or almanacs, and even if you don't have a sextant. Of course the sextant methods it describes are more accurate than the non-sextant methods. The non-sextant methods can be good enough to get you there, however, and with them you will be able to learn to navigate like the ancient Polynesians did, but without having to memorize the huge amounts of star data they had to. This book contains the relevent star data in its star charts and tables, and explains in detail, with worked through examples, how to use these tables to find your position. This makes it much easier for you than it was for the Polynesians, whose navigators devoted their lives to the task. You'll also be able to get your position better than them, for if you have a watch set to Universal Time (or accurately set to any time zone) you will be able to determine your longitude (as well as your latitude), which they couldn't do, simply by timing sunrise or sunset, consulting tables in the book and doing some very simple calculations. I sometimes sell hard copies of Celestial Navigation Without Almanacs to fellow sailors I meet while cruising. The ebook I sell online is exactly the same .pdf file that I use to print out these hard copies, and it makes a very elegant book. Just take it to a print shop on a flash drive and get them to print it and comb bind it. Doing it this way allows you to buy the book for $9.95 to read (saving $28 on what the hard copy price plus shipping would be), then to print it out if you like it and want a hard copy with you on your boat (for $13.16 at Fedex Kinkos). This not only gives you the choice of whether or not you want to pay for a printed copy, but also avoids the cost of shipping and the problem of a printed copy being damaged during shipping. You can pay by credit card or PayPal, and I will email you the ebook as an attachment. You can take the following link to the page where you can buy the ebook (and see recommended instructions on how to print and bind it), or you can read more about the book and take a later link to buy it if you wish to. 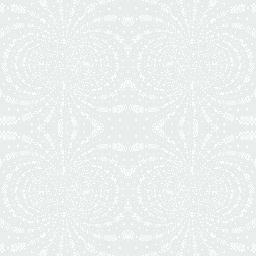 The following short fictional account shows, with illustrations, how this book could get you out of trouble if you find yourself without a working GPS, gives you an idea of what techniques the book makes available to you, and explains how some of these techniques work. I'm half blinded by the flash, and my ears hurt. Did the lightning burn a hole in the boat? Is she going to sink? My heart races as I pull the cover off one of the bilge inspection ports, and put my hand down into the darkness. I can only feel about an inch of water there. That’s a relief! What about the mast? I climb up the companionway stairs and push open the hatch. Amazingly, it’s still up there, though in the dark I can’t quite tell what condition it’s in. The mainsail is flapping away in the wind and seems intact. Could be worse! Okay, maybe I just got out of jail free? Better get on with setting the old boat on course again to Hilo Bay. Hmm, the autopilot seems to have stopped working. Maybe affected by the lightning? Oh, what about all the other electronics? I look around. The GPS is off, and I can’t turn it on. And the same with the radio. But the cabin lights are still on. I search for the backup hand-held GPS. It, too, doesn’t work. Same with the VHF and SSB radios — can’t even turn them on. How am I going to find those little islands, way out there, without GPS? Then I remember that I bought a little book called Celestial Navigation Without Almanacs a few years ago, just in case something like this happened. At the time I read it and tried some of the techniques in it, then put it away and forgot about it. One thing I remember from it, though, is the importance of keeping Universal Time, if you want to know your longitude. I grab my analog quartz watch. It, too, has stopped, but it still shows the time, a few minutes ago, when it stopped. I quickly get out my wind-up watch, wind it up, and set it to five minutes after the time when the quartz one stopped, my best estimate of how long had passed. That is 04:29 UT, tomorrow’s date. And I know this watch goes about ten seconds fast a day, so I’ll be able to adjust for that. I’m at about W127°, so my time difference from UT is close to 8 hrs 30 min, making it about 8:00 pm local time. There’s still a long night ahead of me. But I’ll figure out how to use that celestial navigation stuff to get to Hawaii, I know I will! I go out into the cockpit with some bungee cords and spend about an hour lashing the tiller with them in such a way that the boat will keep a west-south-west course reasonably accurately. Then I go down below to look at that nav. book. Flicking through it I notice the table giving the dates and times of the phases of the moon through 2050, used to figure out what the current date is if you lose track of it, perhaps by being knocked unconscious and not being sure what day it is when you wake up. I can see how useful that would be! Thankfully, though, I don’t need it this time. On to what I can use. I have a good quality plastic sextant that I learned to use, so if the sun’s out I will be able to make a noon sight tomorrow. The book has, in its tables, all the required information through 2050 to accurately get the sun’s declination and the equation of time correction, needed to get my position, to within a couple of nautical miles, from a noon sight. Because of this, I haven’t had to buy sight-reduction tables and new nautical almanacs each year. Besides, I don’t understand how traditional celestial navigation works, with all its spherical geometry, and would just have to do all the sight reductions by wrote. And I know I’m much more likely to make mistakes, and not pick up on them, if I don’t understand the process. Noon sights, though — I understand them, especially after reading this book, can picture what’s going on in my head, and the reason for every step in the process is clear to me. 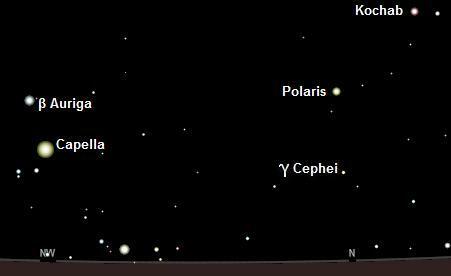 From Table 11 and the star chart, I know that Polaris is about ½° below the pole and γ Cephei is 12.3° below the pole. That means it is about 11.8° between the two stars. It looks like the distance between γ Cephei and the horizon is a little greater than the distance between the two stars. I estimate it as 13°. Since the distance from the pole to the horizon is my latitude, I can add γ Cephei’s distance from the pole (12.3° from Table 11) to my estimate of its distance above the horizon to get a latitude of 13° + 12.3° = N25.3°. I know that my last recorded latitude, in my log book, from a few hours ago was N25° 45’ (N25.75°), and that I’ve traveled a little south since then, so it looks like the height of γ Cephei above the northern horizon when it is directly below Polaris will be a useful indication of my latitude. I remember the book saying that one way to estimate these small angles is to use binoculars, and see what fraction of the field of view different angles are. I think my 7X50 binoculars have a field of view of about 8°, so I grab them and point them at Capella. Capella and β Auriga just fit inside the field of view, with just a squeak of sky either side of them! I try to burn into my memory just what that tiny distance they are in from either edge looks like, because when γ Cephei and the horizon span the binocular’s field of view by just the same amount, I’m at the latitude of Hilo Bay! Table 15 in the book says α Crucis and γ Crucis are 6.0° apart. α Crucis is almost exactly south, I determine with my hand-bearing compass, so is very close to its upper meridian passage. In other words, it is almost directly above the south celestial pole. I estimate the distance of α Crucis above the horizon is very close to 1/3 the distance between α and γ, that is 6.0°/3 = 2.0°. But this is its apparent distance. I look up the tables to see how much higher up refraction and dip are making it appear. The answer is 0.35°, so α Crucis is really just 1.65° above the horizon. Table 10 shows α Crucis is 26.8° distant from the south celestial pole. This makes the distance of the pole below the horizon (my north latitude) equal to: 26.8° - 1.65° = N25.15° = N25.2°. This is close to the value of N25.3° I got an hour ago from the altitude of γ Cephei — a nice confirmation that getting one’s latitude from stars that make meridian passages close to the horizon really works. Each degree I make southward, α Crucis will get one degree higher above the horizon at its upper meridian passage. As the book points out, at N21°, the latitude of the north part of the island of Maui, α Crucis will be seen to be exactly 6.0° above the horizon, the same distance above the horizon as the distance between α and γ, making the angle very easy to estimate accurately. I recall that the ancient Polynesian navigators found their way to Hawaii from Tahiti using the stars, and that the height of the Southern Cross above the horizon seems to have been one of their most important guides. I work out that at the latitude of Hilo Bay, α Crucis will be seen to be 7.2° above the southern horizon — just a touch less than the 7.6° that γ Cephei will be seen to be above the northern horizon. Now I have two stars I can steer to Hilo Bay by, one in the north, and one in the south, maximizing my chance that one or the other will show itself, even if there are a lot of clouds about. I notice the book describes one more method for using stars to find latitude without a sextant. It is based on timing the setting of close setting star pairs to see how long one sets after the other. Table 18 in the book gives what these times should be for various different latitudes for 29 different star pairs. I look through it to see which star pair I could use. The star pair has to set at night at this time of year, of course, or I won’t be able to see them set. Conveniently, the table lists the months when they set at night. From the table I see that Acrux (α Crucis) and Regulus set together at N15°, and can be seen setting at night between March and July. I work out from the table that at N25°, close to where I am now, Regulus should set over 2 hrs after Acrux, but that at N19.75°, the latitude of Hilo Bay, Regulus should set about 56 minutes after Acrux. I use the star charts in the book to find Regulus, and there it is, up near the bright red planet Mars. I see from its position that it is likely to set well after midnight. Though it will probably not be as accurate at confirming my latitude as the height above the horizon of the other two stars I have, this will be a useful extra check, especially if as I approach Hilo Bay it is cloudy earlier in the evening, but clears up after midnight. Of course, if the sun obliges and isn’t hidden behind clouds, my noon sight each day will give me the most accurate measure of my latitude and longitude. If clouds prevent me using any of these methods, there are, however, even more options. The book describes two more methods of determining latitude: taking a sextant sight of Polaris at morning or evening twilight or whenever there is a moon to light the horizon so it can be seen well enough through a sextant, and determining latitude from the day length through tables provided in the book. I will look into these additional methods tomorrow. Now I need to get some rest, as I’ll need to be up at dawn to determine my longitude from the UT time of sunrise. The book provides tables enabling me to easily calculate my longitude if I know either the sunrise or sunset time, my approximate latitude, and have Universal Time. Since I set my wind-up watch just after the lightning strike to five minutes after the time my analog quartz watch stopped at, I realize my wind-up watch could be up to two minutes fast or slow of UT. I’m confident, however, that tomorrow morning my dead reckoning position from my last known GPS position will still be accurate to within 12 nautical miles, so I should be able to work out what the UT time will be at sunrise to the nearest minute, and reset my watch to be accurate to the nearest minute as a result. Since the Earth rotates through one degree each four minutes, this means the longitude I calculate could be out by up to one fourth a degree for this reason, and by up to another fourth of a degree because of the limitations of the technique. But at least I’ll know my longitude to within about 25 nautical miles as I approach Hawaii, which will enable me to know the 10 to 12 hour period during which I will make landfall as I sail west at the latitude of Hilo Bay. That will be a lot better than not knowing my longitude at all! Well, I used to use my radar to keep watch for me while I caught some sleep during the night, but after the lightning strike it’s not working, either! Just have to take a series of cat naps through the night, have a good look around between them, and hope for the best. At least I’m well south of the shipping lanes to Hawaii! If your GOAL is to Get Out And Look at the night sky, here are a number of things you can look for. 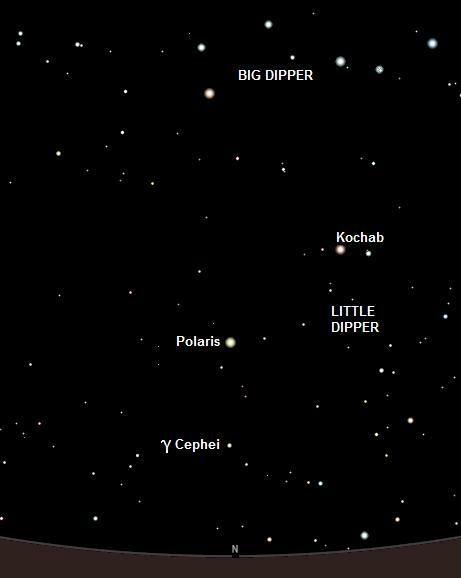 Polaris: If you are in the northern hemishpere, you can find Polaris, the north star at any time of year that you can see the Big Dipper. The two end stars of the dipper at the dipper end are called 'The Pointers' because a line through them points quite close to Polaris, as shown in the following diagram. Of couse, the Big Dipper will not always be above Polaris as in this diagram. It could be at any angle of rotation around Polaris. Polaris shows you the direction of north with an error of less than one degree, and its angle above the northern horizon is, to within a degree, your latitude. Orion Rising: From August through November you can, at various times of the night, see Orion rising above the eastern horizon, preceded by the gorgeous Pleiades. It is a spectacular sight, and you can also use it to estimate your latitude. To find out how to click here: Get Your Latitude from the Stars while Sailing to Baja in November. At latitude 33 degrees North, Orion rises exactly parallel to the horizon. At the opposite time of year Orion sets exactly parallel to the horizon at latitude 33 degrees South. Take a look at the Pleiades with binoculars if you can. Enjoy looking at the stars!